The Annual General Meeting took place on Thursday June 17th at which the President reported that during 2010, membership increased slightly to 119. He was also pleased to report that the Observatory Centenary party held on April 25th was a great success, attended by more than 100 members and guests. He thanked all members of the Astronomical Section who had worked so hard to ensure that the event was an occasion to be remembered. During the event our Meteorological Secretary, Philip Eden, was presented with a plaque from the Meteorological Office in recognition of 100 years of unbroken daily readings from the same site, an achievement that we can justly take pride in. The President also reported that despite bad weather at the start of the year, upwards of 1000 visitors attended the observatory open nights during the session — a truly great result in our centenary year and proof of our continuing commitment to our founding principle — 'to promote and encourage an interest in science'. Enclosed with this Newsletter, is the new Programme card for the 2010 — 2011 session. I am sure you will agree that once again our Programme Secretary has produced an interesting and wide ranging series of lectures for the coming year. The new session of lectures begins on Thursday September 16th when Peter Hingley from the Royal Astronomical Society will talk about ASTRONOMERS AND ODDITIES - I look forward to seeing you at the meeting. The BSA Branches Away Day will be held on Monday 13th of September at Aston University Birmingham as part of the British Science Festival. All members who attend will receive a free weekly pass to the Festival which takes place 14-19 September on Aston University Campus and at Birmingham University Campus. The Away Day is open to all members. It will start at 10:am and close at 5:00pm. Lunch and refreshments are provided. Travel and accommodation expenses will be provided. If you wish to attend please contact. The debate on the role played by anthropogenic CO2 in climate change continues. It has in some quarters, been singled out as the main cause of enhanced global warming, being produced by the ever increasing industrial activities of mankind. There is however, another possible culprit lurking in the shadows that has so far received much less media attention. This substance is 21 times more effective than carbon dioxide as a 'greenhouse gas' and there is mounting evidence that it has in the past been responsible for rapid climate change and species extinction. The substance is Methane CH4. The analysis of gas bubbles trapped in deep ice cores obtained from polar regions has revealed enhanced concentration of methane at times of past planet-wide glaciations, which occur at approximately 100,000 year intervals. Methane is produced by bacterial activity and it was assumed that this was the cause of its increased concentration. Methane is produced anaerobically by bacteria in a process called methanogenesis which breaks down organic material particularly in marshland environments. In the presence of air, the gas forms an explosive mixture and its occurrence in deep mines was always a threat to safety before the invention of the miner's safety lamp. The presence of methane in planetary atmospheres could be interpreted as a signature of life, indicating bacterial activity and the recent detection of just such a methane signature in the Martian atmosphere, has caused some excitement, but methane occurs widely in the Solar System, produced by abiotic processes. Apart from these natural sources, methane is also produced by the break down of organic compounds in landfill sites where we carelessly dispose of rubbish and by fermentation and bacterial action in the digestive tracts of ruminant animals and pigs and chickens bred in increasing quantities for 'fast food'. It has been shown that vast amounts of methane exist on Earth in permafrost in polar regions and in the oceans in sedimentary deposits around continental margins. Under conditions of high pressure and low temperature, methane and water molecules combine to form clathrates or methane hydrates but the compound is unstable and it requires only a small increase in temperature or a slight decrease in pressure caused by falling sea levels for example, to release large quantities of the gas into the atmosphere. Just how much methane is stored in these conditions is as yet undetermined but it is estimated that it could be as much as 3000-4000 times the concentration found in the Earth's atmosphere today. Measurements of methane abundance in Earth's atmosphere have revealed a sharp increase in recent years. In 1998 methane abundance was calculated at 1,745 parts per billion (ppb). By 2008 this had risen to 1,800 ppb and in 2010 the figure is 1,850 ppb, higher than at any time in the last 400,000 years. Methane eventually breaks down in the atmosphere producing carbon dioxide and water. During the 1980's, analysis of gas bubbles trapped in ice cores showed that the climate changes from glacial to warm periods were mirrored by rapid increase in atmospheric concentration of methane.1 It could well be the case that this increase is due to the release of methane from methane hydrates 2 There could be many processes that trigger the release. Changes in the temperature of ocean currents, lowering sea levels and earthquakes disturbing ocean floor sediments could all contribute to the destabilization of methane hydrates and release the gas into the atmosphere. In view of its far greater efficiency as a 'greenhouse gas', the increased concentrations of methane in the Earth's atmosphere may be a greater cause for concern when determining the causes of climate change and global warming. This is another natural process over which we have (as yet) no control. Caesar forged a career in IT troubleshooting, driving around the City on his motorbike, fixing computers for large companies. It was during these excursions that he got the idea to do the 'knowledge', eventually passing the test to become a licensed black cab driver. During the last few years, he supplemented his income with some part time cab driving. Whenever he was in north London, whether fixing computers or driving his taxi, he would often telephone me and drop in for a cup of tea and a chat. When his illness was diagnosed, he knew it was serious and he faced the treatment with great courage, enduring several sessions of chemotherapy. He openly discussed his condition and never once did I hear him complain about the 'rotten hand' that fate had dealt him. Caesar was a devoted family man, very proud of his children and he was always prepared to work hard to ensure that they had a secure and comfortable life. 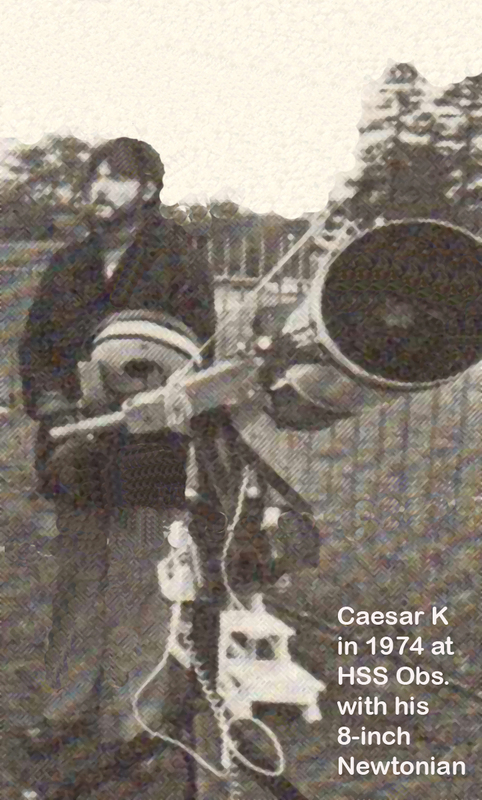 He was an enthusiastic amateur astronomer and a faithful servant of the Society. During his long membership, he would have introduced hundreds of people to the delights of the telescope and he will be sorely missed by his many friends in the Society all of whom convey their deepest sympathy to his wife Julie and his children Alexander and Katarina. The funeral took place on Tuesday 27th July with a Requiem Mass.at St.Joseph's RC Church, Dorking Surrey, followed by a short Cremation service at Randalls Park Crematorium, Leatherhead, Surrey and a reception at the Burford Bridge Hotel, Boxhill. The family requested NO FLOWERS, but donations to the following charities would be gratefully received made through: Sherlock and Sons Funeral Directors of Trellis House, South Street, Dorking, Surrey. The Fountain Centre of St.Luke's Cancer Unit, Royal Surrey County Hospital, Guildford, Surrey.